The Examkrackers MCAT Inorganic Chemistry book is a great content review book for the chemistry section of the MCAT. The Examkrackers MCAT Inorganic Chemistry book is a great content review book that can help students to better understand the major topics that are tested on the Chemistry section of the MCAT. It is a part of the Examkrackers Complete MCAT book series. Although it was designed to be a content review book, there are quite a bit of practice questions dispersed throughout the book. At the end of each chapter, there is a 30 minute practice exam, in addition to practice examples throughout the reading. One thing to note is that the Examkrackers books are known to be less detailed than its competitor’s books. And they tend to focus more on strategy, and giving students a general understanding of the major topics, rather than a super detailed approach. For some this is perfect, however others find the books to be too general. The Examkrackers book is a content review book that focuses primarily on teaching students the general knowledge for the Chemistry section of the MCAT. There are 8 30 minute practice exams, 1 for each chapter. However, I would be cautious to say that this is enough practice problems to prepare you for the MCAT. In terms of quality, this book is very well written, with many illustrations and tips to help guide students to becoming better MCAT test takers. Students who have a relatively good background in chemistry have found this book to be extremely effective because of its easy to read text and less detailed nature. In regards to the real exam, the Examkrackers Chemistry Review book is great. While the actual text seems to gloss over the content at times, giving students a false sense of knowledge, the practice problems are spot on in difficulty and type. Plus, the knowledge itself is all extremely accurate and given that there are 8 editions of the book, many revisions have taken place on the book. At around $20, this book is quite worth it. Especially for those students who are looking for a general review book, rather than an in depth textbook. 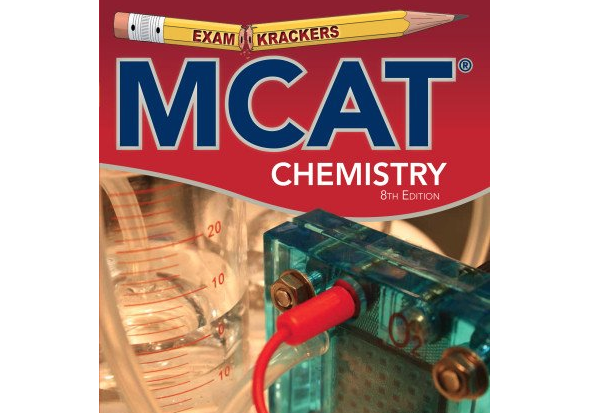 The Examkrackers MCAT Chemistry review book is available online as well as on Amazon in new and used copies. All in all, if you’re looking for a MCAT Chemistry content review book that is easy to read and focuses less on the details, this book is perfect for you! The Examkrackers MCAT Chemistry Review Book is a part of our Best MCAT Chemistry Books Review. See where it stacks up!